Hey, hey! I’m finally back to somewhat normal patterns, which leads me back to Wonderwhat! I’ll do my best to keep updating with thoughts about our upcoming studies, but I will warn you that for the next month or so, I’ve got a lot on my plate. For the last year, Ken Raney of Clash Creative has been negotiating with Voice of the Martyrs to do a series of graphic novel adaptations of some of the stories of triumph that have come from Christians who have endured persecution in closed nations. I was asked to participate in this project, and a few weeks ago, they finally gave the go-ahead. Needless to say, I have a lot of work ahead of me in laying out, penciling, inking and hopefully coloring said project. Ben Avery wrote a compelling script…which has had me in tears multiple times as I’ve tried to convey this story through pictures. Pray for me if you think of it…I need to learn how to draw and fast….I want, with all my heart, to do this story justice. This Sunday we’ll be looking at Luke 4:1-13. It’s a fascinating passage about the temptation of Christ in the wilderness. It provides us food for thought concerning our own struggles with temptation…but it also gives us an amazing insight into just what kind of Messiah Jesus intended to be (and IS). Jesus had to break with many of the expectations concerning the messiah in His day, and we see that the break from accepted patterns wasn’t just a public thing…it was initiated in the most private of times, alone and unobserved. Here’s something interesting: if you get the chance, read Deuteronomy 8 and then read Luke 4:1-13 right after it. What connections do you see? Do you think there was a point being made in the nature of the temptations recounted in Jesus’ story? Beyond that, what do we learn about the nature of temptation in general? If we describe it as settling for less…less than what? What do we learn about how to resist temptation from Jesus’ story? This should be an interesting study…hope to see you this Sunday! glad to have wonderwhat back, and I will read Luke and Duet and get back to you. My favorite book in the Bible is Deut. I know some think I am crazy, but I love that book. I get so much out of it. What connections can we make? The Israelites were 40 yrs in the desert, & 40 days for Jesus in the wilderness. Both were tested to see what was in their heart. Both were tested with food — the manna provided for the Israelites, and Jesus was hungry and tempted to turn the stones into bread. Jesus stood on the Words that came from the mouth of God to help him withstand temptation, and Deut. warns us to be careful in what we say…in believing that WE have the power to make things happen…therefore the power to withstand temptation. We learn that there isn’t anything new under the sun, that temptations are the same for everyone, in every age, and if we allow ourselves to follow the “evil one” it will destroy us…or destroy God’s best for us, and keeps us from doing the will of the Father. Just a few thoughts…. It still lights me up, when one can find the words of the Gospels/New Testament in the Old Testament. Simply put I can only think that both messages say that temptation lies ahead, don’t be amazed or surprised by them. And like the Israelites and Jesus, it will present itself even while under the provision of God. Somehow I get the sense that all temptation gets back to the idea of who is God here. Our Lord or that (or who) has placed itself in front of you. So if temptation is not the question (Why am I being temptated? 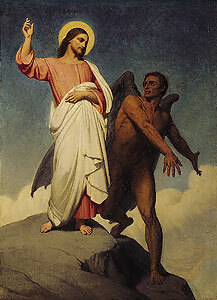 ), can who provides during times of temptation be the question we need to ask? And if it is always there, does that imply a huge difference between the temptator and the provider? Can we really tell the difference, and if so how?